Christmas at home, for a lot of people, is super comforting. You get to head back to mum and dad’s and just eat and relax and be taken care of for a few days. Winner winner, turkey dinner! OK, so you could do this away too if you wanted, but it’s a little embarrassing. When it’s just your nearest and dearest present; you don’t have to glam yourself up. The dog won’t care if you’re in your joggers all day! You’ve got new places galore to explore! While all of the comforts of home might be the dream for some; going away for Christmas means you can get out an enjoy some exciting new scenery. Here at the Langstone Cliff we’re surrounded by miles of beautiful Devonshire beaches- perfect for that Christmas day walk! Speaking of Christmas day walks, with all of this open space down in Devon you can burn off all of that Christmas pudding! Not to mention all of the glorious sea air- it’s good for the waistline and the soul! The ‘away’ side of that list sounds pretty tempting, doesn’t it? No responsibilities; just all the food and fun and frolics of Christmas. We know you’re intrigued. So why not book yourself in for one of the most delightful Christmas breaks Devon has to offer? 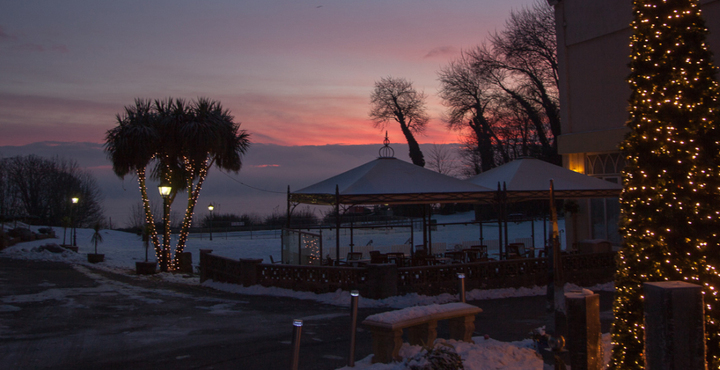 To book your fantastic festive Devonshire stay, give us a call at Langstone Cliff on 01626 221329 today!